I find the finger movements of accomplished piano players to be poetic and mesmerizing. I don’t have delusions of ever reaching that mastery, but I do want to be able to play a few notes on a piano when accosted by one! So, a few years ago, I bought a cheap (but 61 key) electronic keyboard from Craigslist – a Casio CTK-400. And it sat in the closet till I was suddenly bestowed with oodles of time 2 months ago. So, I brought forth the keyboard from the darkness of my closet and embarked on a journey to learn to play Für Elise. I tried an ‘easy’ version for a week, but got disenchanted quickly because it sounded not nearly as pleasant as the true Für Elise. So, I downloaded the original score as a PDF document – and was flummoxed by the complexity of the notation! Mind you, I had no prior training in reading musical scores. That sent me on a detour to learn the basics of musical notation. It turned out to be much easier than I thought – I was able to read the score within an hour of starting out. Of course, I still read one staff at a time, and only by deduction, but at least I know what most of the symbols mean. The initial few weeks of learning the piano was literally painful. Since the tendons and ligaments on your hands are not accustomed to the kind of reach you need for moving between keys, I couldn’t get more than 10 mins of playing in each session. But that has improved significantly in the 2-3 months I’ve been practicing, and now I can practice easily for one hour each session. I’m can now presentably play the first page of the Für Elise score after 2 months of regular practice. A few weeks ago, while practicing an especially intricate part of the score, I hit the B4 key, and it snapped! Most people would venture out to buy a new keyboard at this point, but pas moi! What’s the fun in buying a brand spanking new gadget when you can fix a broken one!!! My initial plan was to simply replace the broken key with one of the keys in a higher octave. So, I unscrewed the dozen odd screws of the bottom of my Casio CTK 400, took off the plastic enclosure on the top, and was immediately foiled. You see, they keys on an electronic keyboard aren’t individual keys. 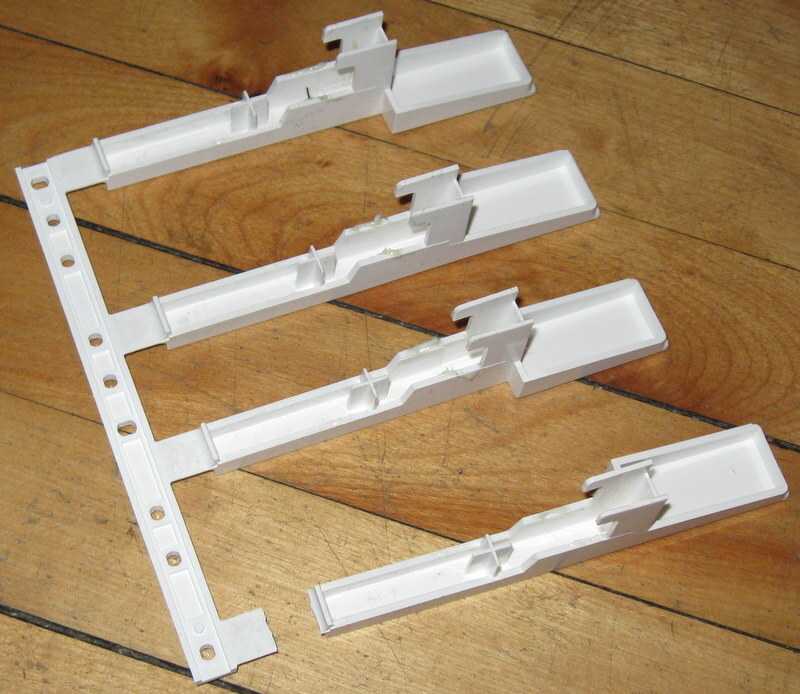 They exist in banks of 4-5 connected keys built as a single plastic mould. And each set is shaped differently, so there are very few interchangeable sets. 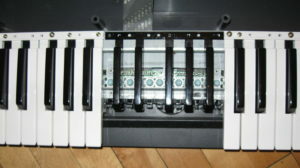 And the sets are layered, typically each octave consisting of 3 layers (2 layers for the white keys and 1 for the black). That left me with only one option – somehow connect the broken key to the rest of the keys in the set. I could use superglue, but there would be sufficient strain at the join to break the key again at the very next stroke. So, I improvised. The solution I came up with was to brace the joint with a piece of metal. 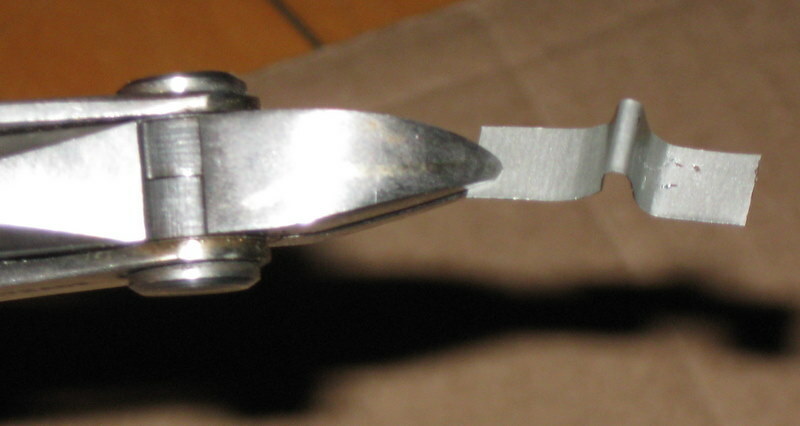 The metal strip would take up most of the strain when the key flexes, leaving the joint strain-free. I got my tin-snips out, located a can of tomato pureé in the recycle bag, and cut a piece of the can. 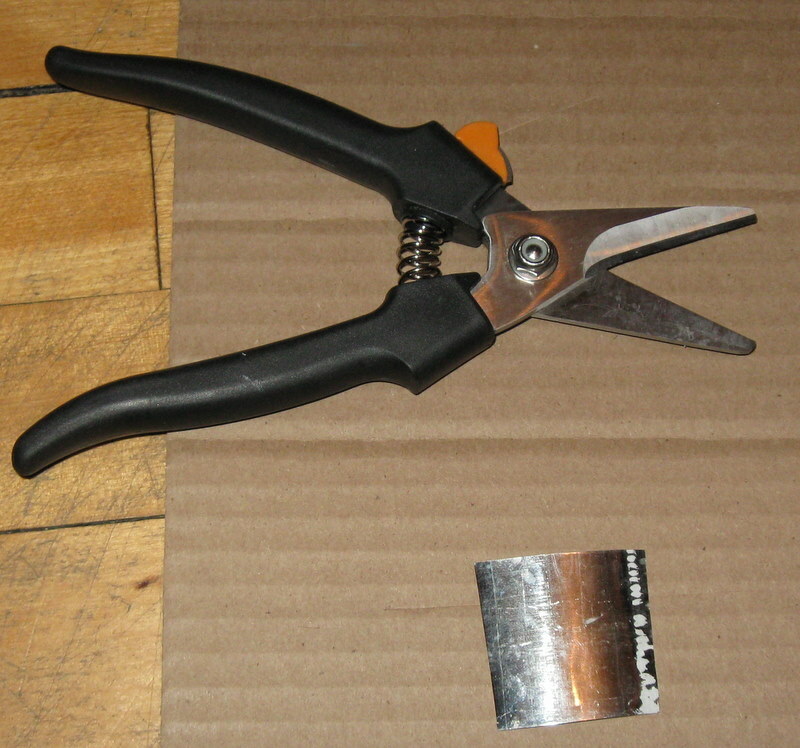 I had to snip the top edge of the can using cutting pliers since the lip is too thick for the tin snips. Cutting the rest of the piece out was easy. Tin Snips and Metal piece from tin can. 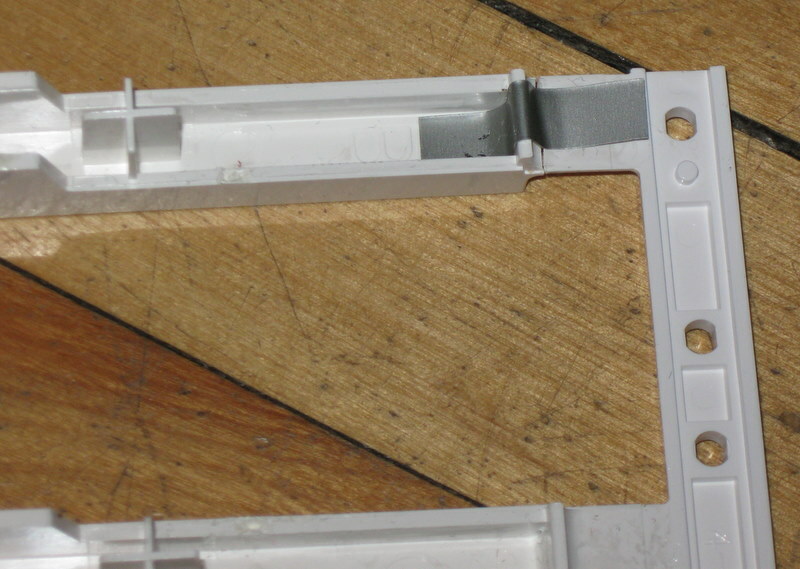 I then cut a thin strip out from the square piece – wide enough to sit inside the key cavity. I shaped the strip to follow the contour of the part where I was gluing. I first glued the 2 plastic parts where it had snapped using super glue. Then I put one drop of superglue on each end of the metal strip, and held it against the plastic surface for 10 seconds to get a firm bond. I had never noticed this before, but for a few seconds, the surface you are glueing heats up! One thing you need to make sure is that both the metal and plastic surface are completely clean. I scrubbed the metal surface against the cutting edge of the snips and the plastic surface using some rubbing alcohol. The inner surface of cans have a plastic liner, so if you don’t scrape that liner off, you will only get a superficial bond and the metal will come right off since there is no glue on the metal surface itself. I was then able to put the keys back together, and the piano was working again, save for a slightly harder stroke on the B4 key. Update: The same key broke again after 2 weeks right beyond the end of the metal strip. I guess the plastic strip meant to provide the flexion is at the end of its life. Not to be defeated easily, I braced it again with a strip of metal on the other side.Let’s see how long this lasts. But the writing on the wall is clear – I need another keyboard if I intend to continue learning! Acknowledgements: Thanks to FreeFoto.com for the Creative Commons licensed stock image of a keyboard. Same thing just happened on my Casio CTK-720. In my case, middle E bit the bullet. From what I can tell, it’s the same key situation, but I’ll open it up anyway just to make sure. Sadly, the keyboard is one week short of its first birthday. I guess we just rock too hard, friend. Wow! My “D” key just snapped yesterday! I thought that I would try to see if anyone had a repair and here you are. I’ve had my Casio for exactly two years, and hoped to have it for at least another couple of years. The fact that the break occurs at a truly obnoxious join where the pressure is going to be immense, indicates that maybe we should be able to buy the whole assembly and replace it!!!! I will try your fix, but with something more flexible than tin, like some malleable plastic or fimo clay. That tin looks to be pretty thick, and may be too heavy in relation to the cheap plastic, which may be engineered to break and to require a new purchase. finally, I’m looking up parts for casio keyboards. Do you have a part number for that assembly? HA! I called the Casio parts department and you can get an octave worth of keys by calling 1-800-223-2001. For my Casio CTK 700, the part would cost 12 bucks, including tax and shipping. The bad news is that the parts are backordered for several weeks, because everybody runs out and buys a new casio, so they don’t make them that frequently. Please spread the word so that they will. I might be a customer, because, while I am fairly delicate with the keys, I do tend to get a little exuberant now and again. It makes no sense, because extra force does nothing to affect the tone! My granddaughter has a CTK-720 with broken keys. We have obtained replacement keys but I’m having trouble removing the cover of the keyboard so I can get at the keys. I removed a total of 16 keys from the bottom and the cover is loose on the ends but not in the middle. Can anyone help? Thanks for the information. It was very helpful. I, too, broke the keys on my Casio PX-555R full size keyboard. I have been playing for a long time, and I found that my thumbs match on the G, A, and D keys. Thumbs hit a lot harder than fingers, particularly when doing straight on chords on piano or keyboard, quite common in pop music. They do sell replacement keys. Try 800-435-7732; 800-706-2534. $6.00 for C E G B; $5.00 for D F A. $4.95 S & H + State tax. my daughter’s is the ctk-700. fixed the broken middle key (just w/ super glue) but later decided to also interchange w/ the set on the leftmost. thanks all you guys for the inputs. if it breaks again, will consider getting a replacement. thanks again and more power to all! A little dab of hot glue will fix your busted keys. It’s flexible so it can take the bending. Being a modeler I work with styrene a lot, I had cut a piece of brass shim stock to fix the key when I first seen this site but I thought I would do a test on the broke key with plastic solvent cement and sure enough it was what I hoped for. I keep several thicknesses of styrene sheeting on hand so I was asured I had what I needed. The bump on the key where it broke had to be filed down flush with the back end of the key being repaired. I then used the solvent cement and glued the key back in position, after that I took .005 styrene and filled the void between the mount of the keys to the bumb on the key that was filed down. Once that was dried I cut a .010 piece the width of the key and fitted it 1 inch passed the bump where it had broke. I then glued that piece on topt of the filler, the solvent melts the plastic and fuses the pieces together. I also added a little security by taking a piece of the styrene by folding it and glued it on the other side of the key in the joint where it cracked or broke. Though you can pretty much start using the key right away I would recomend waiting a few hours for the solvent to completly dry. Hope this helps, a few pictures would be much helpfull but I don’t have a clue on how to down load them. One key on my ctk 700 stopped working and I was afraid it too was broken. However once I took the keyboard apart I discovered that rather than a broken key the rubber “spring/contact” for that key is broken. 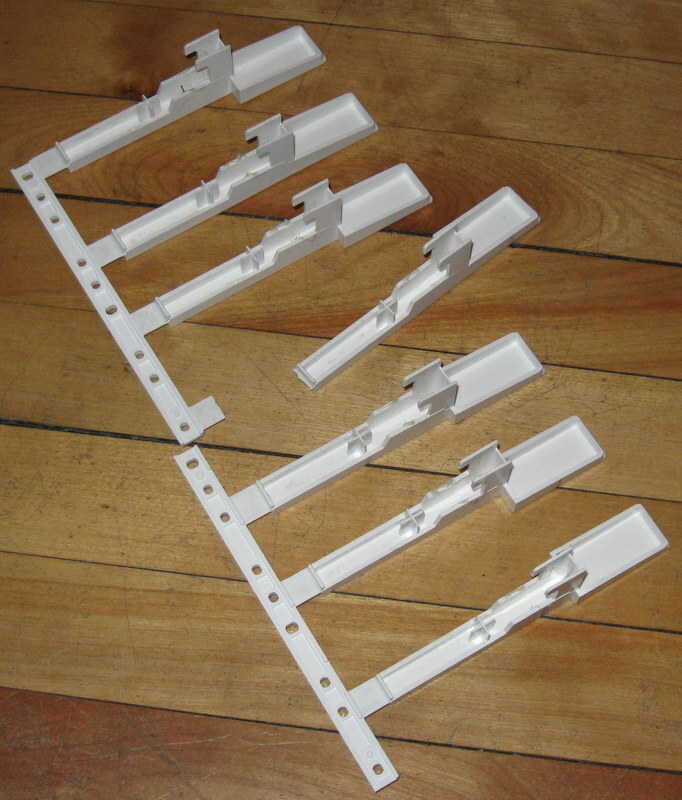 These springs/contact come in a strip for 12 keys. I do not believe these are repairable so I am wondering if a replacement is available. i broke one of my keys off and i dotn know where it is. what should i do ? I have a Casio CTK-551 keyboard. The fast forward control fell off and got lost. Does this part that fell off have a chip or something. Without this control, I can’t fast forward. Any suggestions how I can still use it? 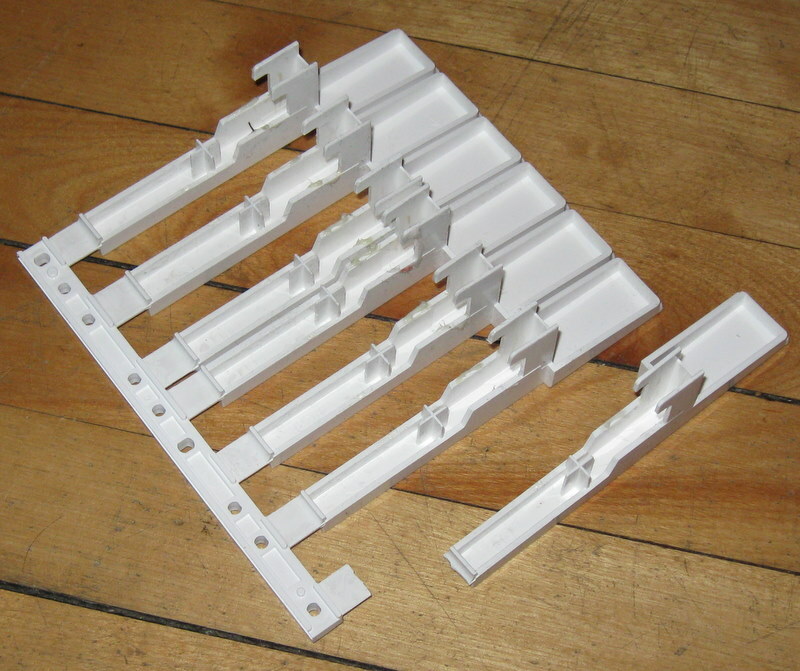 Or where can I obtain this extra part that got lost? The key on my CASIO keyboard was broken. I called 1-800-661-2274 CASIO Canadian Department. Got the part for $5 and replaced it myself. Very simple. Ive got a Casio CTK-551, it is cheap but is useful for my very slow learning.Recently my 2 year old son yanked down on the AC adapter that was plugged into keyboard and broke the power input internal part on the keyboard. How is the best way to fix it? How do a repair a faulty on/off switch? Can anyone help please? 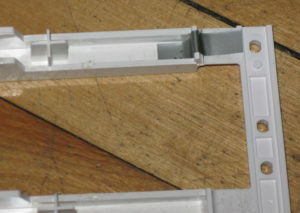 I am trying to find a replacement LCD part number LD-B10432E for my Casio CTK631 keyboard. I have tried Casio and many repairers but so far without success. There must be one out there somewhere! New or salvaged from a keyboard being broken up for spares…..please, please!